Um, yes please. The Statistical Probability of Love at First Sight sounds awesome and just what I need right now. Thanks! It’s adorable, Meredith. Let me know what you think! I bet you’ll love it, Erin. It’s so sweet and it feels so real and effortlessly written. ME TOO. Loved TSPoLaFS so, so much. A friend just returned my ARC, so now I keep gazing upon it adoringly. Bets are on for when I break and go out to buy a hard copy. And I just bought BEFORE I DIE, so when I next feel like sobbing, it’s first on my list. BEFORE I DIE is fantastic. It’s definitely heartwrenching, but there are moments of joy in it as well, which is why I enjoyed it so much. Let me know what you think after you’ve read it! I’m going to buy _The Statistical Probability of Love at First Sight_ TODAY! It sounds like a perfect read for me. A new job is definitely a valid excuse for a reading book. I hope you find time for TSPoLaFS. It’s just so darn good! “The Statistical Probability of Love at First Sight is about people and relationships and learning about one’s self. There are no explosions or evil villains or paranormal beasts, yet I was still at the edge of my seat, flipping page after page to find out what would happen next.” Yes, yes, yes! I have to read this now. Yay! I hope you love it, Rebecca! I’m so glad that you enjoyed this. I have this on my wishlist. If I ever whittle down this pile, I’ll get to it. Yay! Glad to see that it has another cheerleader. Such a wonderful book! I have to add some of the other books you mention to my TBR, they sound great! Glad you loved it too, Elodie. I thought it was absolutely adorable! I’ve been meaning to read THE FAULT IN OUR STARS. Now I’ll definitely pick it up. THE STATISTICAL PROBABILITY OF LOVE AT FIRST SIGHT sounds great too! TFIOS was wonderful. I was lucky enough to see John Green’s show last night, actually, so now I love the book a tiny bit more, if that’s possible. 🙂 Hope you get to THE STATISTICAL PROBABILITY… it’s amazing! I LOVED Statistical Probability! Seriously so cute. And I read it on a plane, which made it even more fun. That’s awesome, Jess! Before I was married I used to hope and pray for the chance to sit beside a cute boy on a plane. Never, ever happened! I loved A MILLION SUNS! Oh, and I will have to add THE FAULT IN OUR STARS to my to-read list. I heard about it on the latest Pottercast when Melissa and her guest discussed it. Sounds incredible! GREAT choices, Katy! I absolutely adored THE STATISTICAL PROBABILITY OF LOVE AT FIRST SIGHT as well and CHASING BROOKLYN is one of my favorites, too. Actually, anything by Lisa Schroeder I love. I love Lisa Schroeder as well, Cindy. I’ve been to a few of her signings and it’s a joy to hear her talk about books and writing. She’s incredibly smart! Oh, everyone is talking about the Statistical Probability…I am clearly going to have to go buy this one. My favorite read in January was EVERYTHING YOU NEED TO KNOW TO SURVIVE THE APOCALYPSE. So good, Katy. Ooh, I’ll definitely add that one to my list. Love the title! Thanks, Christa! Oh man, EVERYONE is loving this book! I can’t wait to read it. I MUST! Also, as someone who is frequently hanging out at airports, the premise makes me smile. MAN. You read some awesome books this month!! January did turn out to be an awesome start to my reading year. And yes, please do check out TSPoLaFS. It’s adorable! My faves were a tie between THE FAULT IN OUR STARS and BRUISER. I also liked SHIP BREAKER, although I read that one a while ago. Thanks for some new recommendations. My pleasure! I haven’t read BRUISER, but I’ll definitely have to check it out. Thanks, Karen! These are pretty much ALL on my TBR list already, so I’m stoked that you liked them all–especially STATISTICAL PROBABILITY. That one looks so adorable. And it’s interesting that you didn’t like TFIOS as much as LOOKING FOR ALASKA… I really loved ALASKA, so I hope TFIOS isn’t just over-hyped when I get around to reading it! Eep! No, I wouldn’t call TFIOS over-hyped. It really was excellent, but ALASKA will always hold a special place in my heart. Perhaps because it was my first John Green? Let me know what you think when you get around to TFIOS! They all look so good! I’ll probably have to read Ship Breaker because I love dystopian (depressing or not!). That last one… y’know with the really long title that I’m too lazy to type – that looks intriguing, too! I have promised myself, though, that my next book will be Across the Universe because I’ve been dying to read it for so long – and then will probably quickly be followed up by A Million Suns. Thanks for the reviews! Well, I loved AtU and AMS, so I’m totally on-board with your next two book choices. 🙂 I hope you enjoy them as much as I did! Dang that’s a lot of comments! 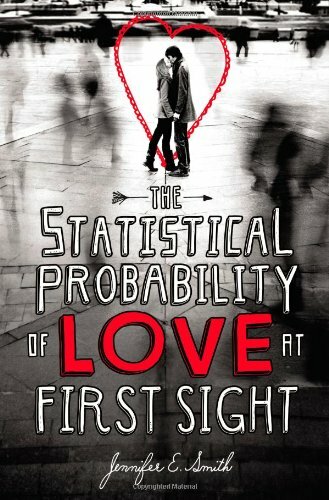 I love stories (okay, romances) where two people meet and connect over the course of a (usually crazy) 24hrs, so I might have to check out The Statistical Probability of Love at First Sight, even though I’m not a huge contemporary YA reader. Thanks for the rec! Best book I read? The Handmaid’s Tale: gorgeous writing, character-driven literary sci-fi (it can be done! ), awesome premise, neat feminist themes. I haven’t read THE HANDMAID’S TALE, but it sounds lovely. I’ll definitely add it to my ever-growing TBR list! Thanks, Sophia!